SALT LAKE CITY (AP) — The goal for No. 11 Utah was clear this season — win the Pac-12 South Division. The Utes have trended upward since joining the league in 2011, but have yet to play in the championship game. Herbert led the Ducks (4-7, 2-6 Pac-12), who have struggled all season and suffered several lopsided losses, on a 10-play, 75-yard drive in just over two minutes, capping it with the TD pass to Carrington. Carrington was initially called out of bounds but that call was reversed after a replay showed he got a foot down in bounds. The Utes (8-3, 5-3, No. 12 CFP) blitzed on the final play and left man-to-man coverage on the outside. The Utes had taken a 28-24 lead with 2:18 remaining off a Troy Williams 30-yard touchdown pass but the Ducks then began their comeback drive. “I’ve got some of the best receivers in the country out there, so I trust them to make catches like that,” said Herbert, who finished the game with 324 yards passing and three TDs. He also scored on a one-yard run in the fourth quarter. Royce Freeman led the Ducks ground game with 129 yards. He also scored on a one-yard pass from Herbert early in the fourth. Carrington had a quiet day until the game-winning catch, finishing with 37 yards on five receptions. Joe Williams rushed for 149 yards and a touchdown for Utah. 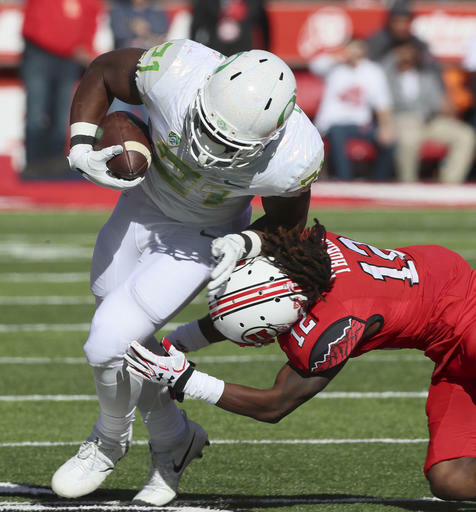 The normally stout Utes defense gave up 575 yards of offense to Oregon. UTAH: The Utes will fall from No. 11 after the loss to an Oregon team that is still three games shy of .500 and won’t reach it this year. The Utes, however, should stay in the Top 25. OREGON: Will remain on the outside looking in. OREGON: The Ducks are still simply running out the clock. Even with a win against Oregon State in the season finale, Oregon would fall shy of the six normally needed to be bowl eligible. This would be the first time since 2004 that Oregon missed a bowl game. UTAH: The Utes lost control of their own destiny. 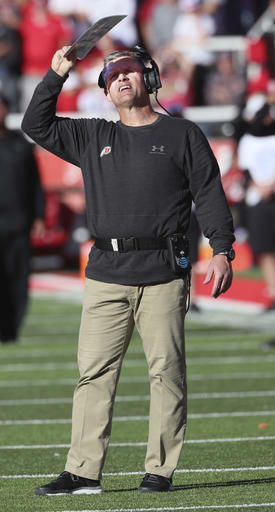 After the Oregon loss, Utah needed Colorado to lose to Washington State to remain in the hunt for the Pac-12 South Division. Colorado won 38-24 on Saturday. The race is now down to Colorado and USC, which beat the Buffaloes 21-17 in October to earn the tiebreaker. 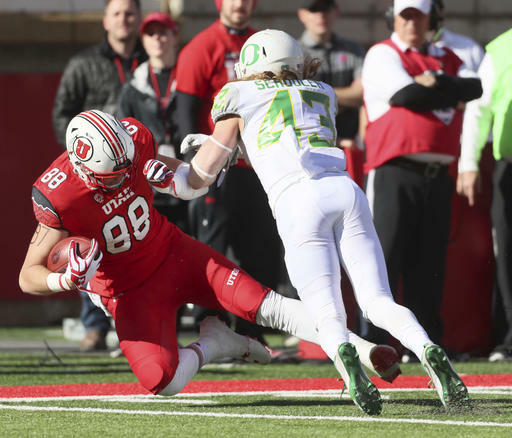 Utah defensive end Hunter Dimick set the school’s career sack record in the first quarter with a sack of Oregon quarterback Justin Herbert. He wasn’t done there, picking up sack No. 2 later on the same drive. He finished the day with two sacks after entering the day tied for the nation high with 12. The record is now set at 29 and Dimick has 14 this season. Oregon starting receiver Charles Nelson was ejected midway through the second quarter after being called for targeting. Nelson peeled back for a block on Justin Thomas as Herbert ran around the right end. Nelson’s shoulder pads mostly hit Thomas in the chest, but there was some contact between his helmet and Thomas’ facemask. Nelson entered the game with a team-high 47 receptions and 501 receiving yards. OREGON: The Ducks wrap up the season against in-state rival Oregon State in the Civil War. UTAH: The Utes travel to face No. 12 Colorado next Saturday.